The Breast Cancer Family Registry (BCFR) is an international resource of multi-generational families, data, and biospecimens established for interdisciplinary collaborative research on breast cancer, which is available to the entire scientific community. Over 30,000 women and men from nearly 12,000 families have generously contributed questionnaire data, clinical data and/or biospecimens. Over 150 individual investigators at all stages of their careers, from pre-doctoral students to full professors have used the BCFR resources since its inception, generating over 300 scientific publications. The BCFR provides an extensive and diverse range of resources, expertise, and specialized skills, and has several unique strengths: 1) the collection of a large number of individuals and families across a wide spectrum of breast cancer risk, including both affected and unaffected individuals; 2) the large collection of families with early-onset breast cancer; 3) the large collection of racial/ethnic minority families not replicated elsewhere; 4) the extensive molecular characterization performed to date; and 5) active follow-up of both probands and family members. Thus, the BCFR comprises a unique cohort of probands and family members at familial/genetic risk of breast cancer that will continue to facilitate a wide range of research studies, such as gene discovery, examination of cancer-related outcomes and risk factors in high-risk subjects, investigation of novel behavioral interventions, and cancer prevention trials among at-risk family members. Consequently, the BCFR Cohort, as one of the few cohorts available worldwide with biospecimens and extensive molecular and genetic characterization combined with epidemiologic data and long-term follow up, will be an invaluable resource for translational research in the genetic epidemiology of breast cancer. Funded by the National Cancer Institute in 1995 under a Cooperative Agreement between six international institutions and renewed in 2000 and 2006, the BCFR is an open resource to facilitate multi- and interdisciplinary research on the genetic epidemiology of breast cancer. The BCFR collects health data and biospecimens from families across a wide spectrum of breast cancer risk. The six BCFR sites have recruited breast cancer families through population-based cancer registries, clinical settings, and community outreach from four areas of the U.S.: 1) the Greater San Francisco Bay area, California, 2) New York City, New York; 3) Philadelphia, Pennsylvania; and 4) Salt Lake City, Utah; and from 5) the Province of Ontario, Canada; and 6) the metropolitan areas of Melbourne and Sydney, Australia. 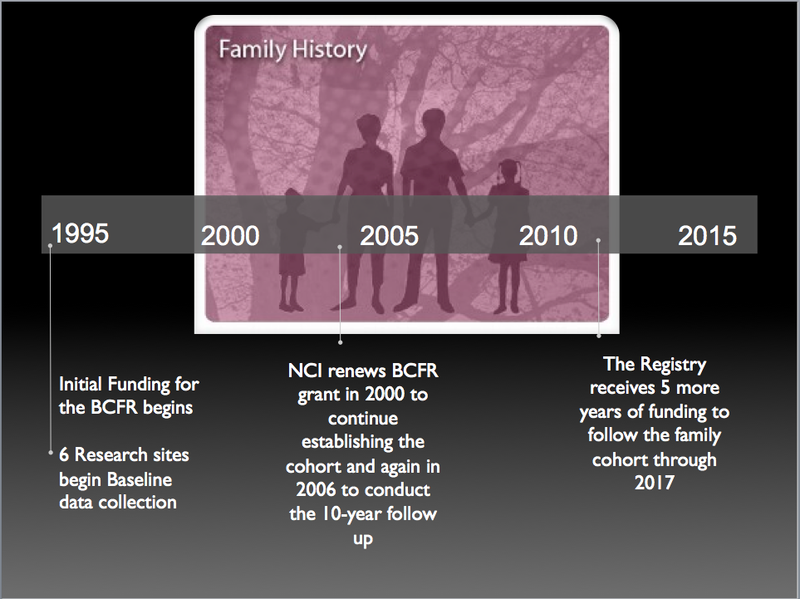 Additional funding from the National Cancer Institute was provided beginning in 2006 and again in 2012 and 2018 to update family history and epidemiological data through research questionnaires and expand the overall cohort by inviting additional family members to participate who have not yet joined the BCFR. Maintaining and enhancing our core infrastructure facilitates our broad research agenda that includes a wide range of studies, such as examination of risk factors and cancer-related outcomes including risk and survival, gene discovery, investigation of novel behavioral intentions and risk communication programs, and cancer prevention trials among at-risk family members.